As you probably know already, influencer marketing has been a favourite marketing tactic among brands over the past few years. While influencer marketing initially focused mainly on lifestyle and fashion influencers, it has now spread across every niche and industry. It has even started gaining major traction in the eSports industry, which is only natural because the industry is growing rapidly. In fact, the global eSports market revenue is expected to surpass $1 billion in 2019. The top eSports team, Team Liquid, has even managed to earn more than $24 million in prize money from playing over 1,400 tournaments. So naturally, the growing industry is also seeing some major players rising up to be eSports influencers – both as teams and as individual players. These influencers typically have significant influence, even on regular social media platforms like Twitter and Instagram. Brands like Coca-Cola, Taco Bell, and Red Bull have already started leveraging these influencers to promote their brands to eSports audiences. So you can expect to see eSports influencer marketing growing bigger every year. You might even want to start including it in your marketing mix before your competitors learn about it. However, if you’re familiar with the eSports industry, you will find that traditional influencer marketing rules and tactics can no longer work here. The eSports landscape is drastically different from other consumer industries. There’s a lot of difference in how the audience consumes content, the kind of content influencers create, and the kind of campaigns you can run. So even if you’re used to running traditional influencer marketing campaigns, you may not necessarily know how to get started with eSports influencer marketing. That’s where an eSports influencer agency enters the picture. These agencies have a thorough understanding of how the industry works and how to run influencer marketing campaigns. They combine this knowledge to run successful campaigns with eSports influencers. These eSports influencer marketing agencies help you develop campaigns based on your goals. They make it easier for you to narrow down on the best influencers to work with. So you can save a lot of time and avoid making expensive mistakes in running your very first eSports influencer marketing campaign. Or you can also search for “influencer marketing agency” and go through their websites to see if they also work with eSports influencers. 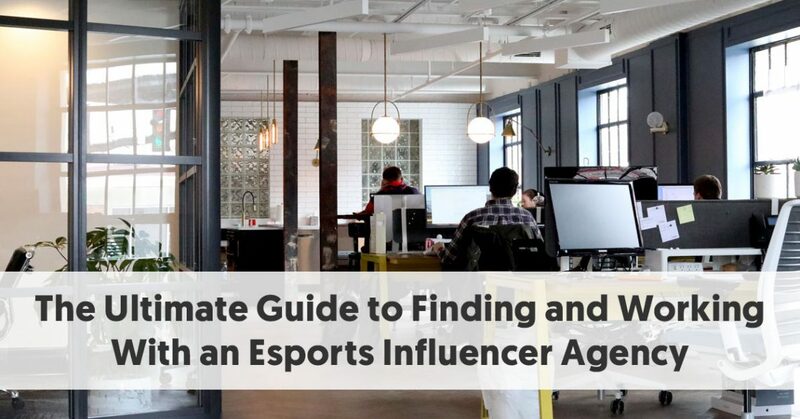 To make this task easier, you can also check out the previous Influencer Marketing Hub posts in which we’ve compiled a list of the top eSports influencer agencies and top influencer marketing agencies. However, it may be difficult to choose which of these agencies to work with. Not all agencies have the same methods, influencer networks, and pricing structures. So, even the top agency may not necessarily be the best one for you. Narrow down your search by asking a few questions. Do They Offer a Full Service? – Consider the extent of service the agency is offering. Some will only help you find and connect with eSports influencers, but they will not get involved in developing a campaign. If you’re new to this, you might want to look for an agency that offers full-service influencer marketing. This will involve planning a campaign, finding and connecting with influencers, and launching and managing your campaign. Is It Convenient to Work With Them? – Has the agency made it easy for you to work with them? Are they located in your country? If not, do they have tools to manage communications and campaigns alongside your team? If the only way to communicate with the agency is through email, you may want to reconsider your options. Research their website and reviews thoroughly to understand how you can work with them. You can then interview them via chat or over the phone to get a feel of what it’s like to communicate with them. See if they offer any tools and platforms that will help clients oversee their campaigns or review potential influencers. Agencies like Upfluence, for instance, have their own influencer marketing software. Clients can track the performance of their campaigns and communicate with their Account Manager right on the platform. This makes working with the agency a lot easier for you. How Big is Their Influencer Network? – Most agencies will have a network of eSports influencers that they work with on a regular basis. They have formed long-term relationships with them and know what kind of brands and campaigns suit them best. It’s important to consider whether the agency has a large network of eSports influencers. Not every influencer will be the right fit for your brand. So if the agency has a larger network, you’ll have a larger pool of influencers to choose from. This means you will have a better chance of finding the best eSports influencers for your brand. Can You Afford Them? – Another important consideration for any brand is the cost of working with the agency. How much do they charge? What kind of payment plans and pricing structure do they offer? Will they fit your budget considering the other expenses you might have in your influencer marketing campaign? These questions will help you narrow down on the right eSports influencer agency to work with. Just as you have to be careful in your search for relevant influencers, you should also take the time to choose an agency that meets your needs. eSports influencer agencies can help you facilitate various types of marketing campaigns involving influencers. If you don’t have a clear idea of what type of campaign you want to run, they will help you make the right choice depending on your goals. Identifying and Managing eSports Influencers – One of the main reasons why brands work with an eSports influencer agency is to get help identifying and managing the right influencers. As mentioned earlier, these agencies typically have a network of influencers that they have already built relationships with. So they know which of those influencers will be perfect for your brand based on your campaign type and niche. Even if they don’t have the right influencers within their network, they are equipped with the best tools to help you with your search. They’ll be able to assess different eSports influencers based on reach, personality, etc. and identify the best ones for you. You can also have them manage your relationships with these influencers for the duration of your campaign. Arranging Brand Sponsorships – Like in traditional influencer marketing, brand sponsorships are one of the most popular methods of working with influencers in the eSports industry. With a sponsorship, eSports influencers will help promote a brand and its products or services by featuring them in their live broadcasts. You don’t necessarily have to be relevant to the gaming industry to participate in these partnerships. Take for example how DrLupo promoted KFC through one of his Twitch PUBG sessions. An eSports influencer agency can help you come up with a concept for your partnership. They can also help you find a relevant influencer to work with and connect with them on your behalf. Arranging eSports Team Sponsorships – Sometimes, teams can be considered eSports influencers too. 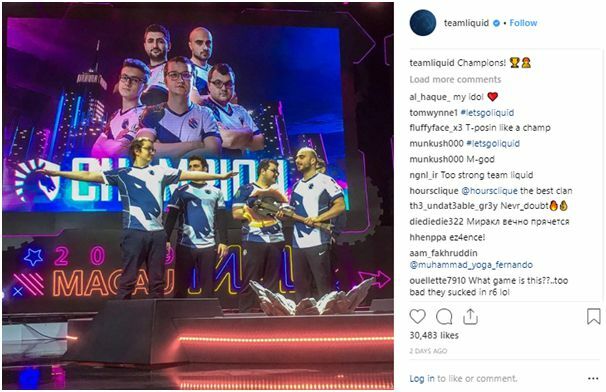 eSports teams like Team Liquid and Evil Geniuses, for instance, have tens of thousands of followers on social media. So brands may want to sponsor these teams as a whole to get their name in the spotlight. However, it may cost quite a bit to sponsor a top eSports team. An eSports influencer agency can help you find the right team to sponsor based on your budget and goals. Since they have a fair idea of how much a particular team is worth and is likely to charge, they can help you narrow down on the most relevant ones. The agency can then handle the negotiation process and help you draft a contract that is beneficial to both parties. Organising eSports Influencer Events – An eSports influencer agency can also be great at organising events for eSports influencers. They can take care of every aspect of the event to ensure that it’s a success. Based on your campaign goals and your industry, they will help you come up with the perfect event that’s relevant to eSports. They will also select the best influencers to invite who can effectively promote the event for you. And they will take care of the invitations, negotiations, follow-ups, and briefing process as well. So it saves you a lot of time and effort, especially if you’re not used to working with eSports influencers or organising events. As you can see, there are tons of ways to work with an eSports influencer agency. Working with an agency is an excellent way to save time and money while keeping everything organised. And it’s a must if you’re new to eSports influencer marketing. You can use the tips above to narrow down on the perfect eSports influencer agency for your business.